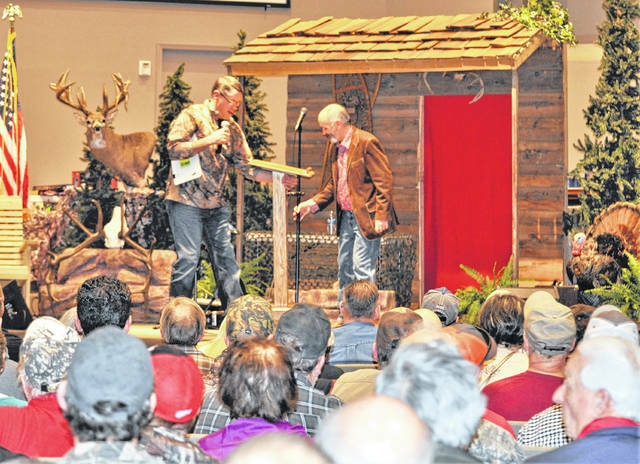 Hillsboro Bible Baptist Church Event Director Troy Putnam (on stage at left) introduces gospel singer Wade Spencer at last year’s Sportsman’s Night Out. The annual event will be Saturday, Jan. 26 at the church on SR 124 east of Hillsboro. This year’s edition of Sportsman’s Night Out is Saturday, Jan. 26 at Bible Baptist Church, less than one mile east of Hillsboro on SR 124. Lamb invited everyone to attend the free annual event, which will officially get underway next Saturday at 11 a.m. with official scoring of deer until 3:30 p.m., outdoor clinics for hunters and families alike from 2 to 5:30 p.m., and for the 6 p.m. evening session, the guest speaker will be Gene Wolfenbarger, founding pastor of Joshua Baptist Church in Joshua, Texas. He encouraged everyone attending Sportsman’s Night Out to bring their favorite wildlife mount for display, and said there will be prize drawings and scoring for mounts as well.He said that last year a total of 70 mounts were scored, and 50 of them ended up in the record books. The Ohio Department of Natural Resources Division of Wildlife will be there as well, and Lamb said every child will receive a duck call which can be assembled and later taken home. ODNR is also bringing to the event its shooting caravan, allowing children to hone their marksmanship skills by shooting BB guns at moving targets. The annual church event is designed not only for the whole family, but for the ladies, too, Lamb said, adding that there will be many craft items given away in addition to several break-out sessions that will be of particular interest to women. One of the most popular things is the giveaway of five all-expenses paid fishing trips to the Canada. The event has grown to the second largest of its kind in the state of Ohio, Lamb said. He expects more than 1,300 people throughout the day with more than 1,000 expected to be in attendance for the Saturday evening session. For more information on this years’ Sportsman’s Night Out, call the Hillsboro Bible Baptist Church at 937-393-2911 or go online at HillsboroBibleBaptist.com.